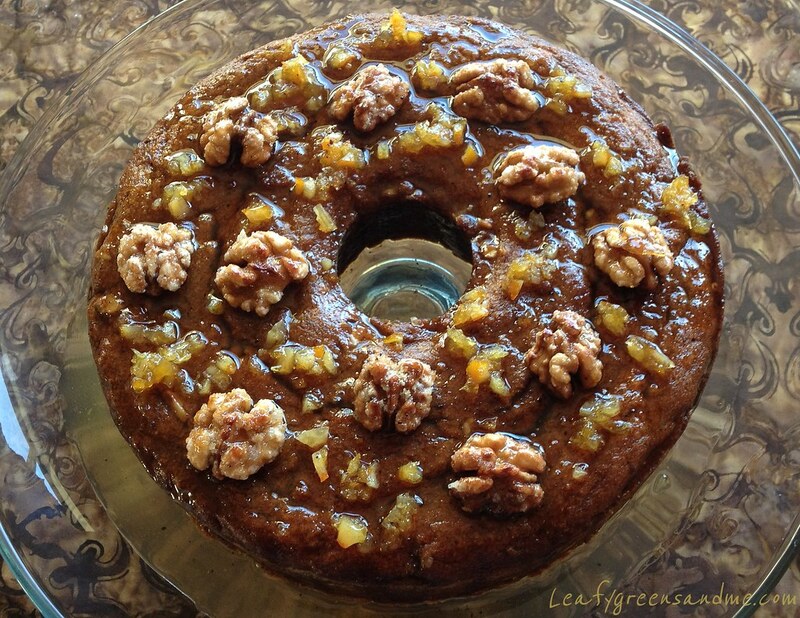 I was flipping through my cookbooks trying to find a dessert recipe that would go well with a traditional Thanksgiving dinner, or potentially My Moroccan Thanksgiving and I came across a recipe for a Pumpkin Walnut Cake with Candied Orange Syrup. This happens to be a perfect recipe for both because it uses pumpkin, but also uses spoon sweets (fruits cooked in syrup), which is a typical for dessert served in Middle Eastern countries. So after veganizing the recipe, and also by adding cardamon spice to the syrup, I think that it turned out great and it is definitely a contender for this Thanksgiving! Note: Kumquats would also work really well with this recipe; however they are very labor intensive because you need to remove all the seeds after slicing. Add water, sugar, cardamon and peppercorns to a medium sauce pan and bring to a boil, stirring to dissolve sugar. Add orange slices and stir to coat each slice. Reduce heat to medium low, and cut out a piece of foil and place directly on top of oranges to slow the evaporation. Cover pan with another piece of foil and slowly simmer for about 1 1/2 hours until syrup is the consistency of honey. 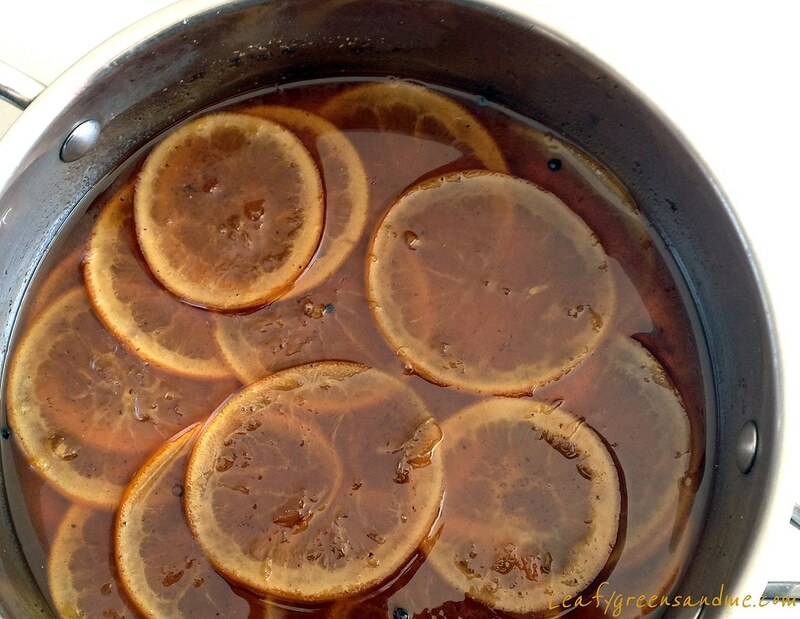 Remove from heat and let oranges cool in syrup before removing. Once orange slices are cool enough to touch, strain syrup into another bowl, pressing the orange slices lightly to remove excess syrup and chop orange slices and set aside. You'll need a 1/2 cup for the cake and 1/4 cup for garnish. Preheat oven to 350 and position oven rack in the middle of oven. Butter an angle food cake pan and dust lightly with flour and set aside. In a medium bowl, add flour, baking soda, baking powder and spices and whisk until combined, set aside. In a small bowl, whisk together egg replacer and water until frothy and set aside. In a large bowl, using a mixer whip butter until fluffy. Add maple syrup and mix again. Next add egg replacer and pumpkin puree and mix until combined. Slowly add flour to pumpkin mixture, and mix just until smooth. Fold in chopped candied orange and walnuts. Using a spatula, spoon cake batter into pan and smooth surface. Bake for about 1 hour, turning half way through the cooking process. Cake will be finished when a toothpick inserted in the center comes out clean. Remove cake from oven and let cool on a baking rack for about 20 minutes. Remove from cake pan and let cool further on rack, positioned over a sheet tray to catch syrup. Spoon syrup over cake and then carefully lift cake to a serving platter or cake stand. Garnish with candied walnuts, candied orange and additional syrup. Bring a small pot of water to a boil and add walnuts. Blanch for about 1 minute and then drain and toss in powdered sugar to coat evenly. Place walnuts on a parchment lined baking sheet and bake for about 10 minutes until sugar has caramelized, turning nuts over half way through the cooking process.